I’ve done something similar in past years by looking up Adult Nationals videos on Ice Network (example: this link starts out with the 2016 Adult Nationals videos) and comparing them to the results, but since the event is scored on the 6.0 system for lower levels, all we get are ordinals. Still very helpful, but it was exciting to see the Vancouver protocols and see what my event category looked like — what jumps are being landed? What kind of GOE is standard? What’s the PCS range for bronze ladies in my age group? For instance, a salchow with zero GOE shows me what a standard, acceptable salchow looks like, compared to one with negative GOE that may have had a two-foot landing, or scratchy exit, or a stumble. That also made me realize that while I feel like I could technically test for silver freeskate within the year (in that I could probably perform the elements at a minimum level), I don’t need to be in a rush to move up to silver because I’m not all that competitive in bronze yet. For instance, I saw that almost every layback spin attempt wasn’t given credit as a layback, and instead got called an UprightSpB — and some didn’t even net upright spin points and got the dreaded dash of doom. Same with sit spints — many ladies had them in their programs, but many weren’t credited at all because they weren’t low enough. Or they had asterisks next to them indicating that some portion of a combo didn’t meet the requirements (I’m guessing it didn’t hit the minimum revolutions). And in the bronze ladies, the PCS scores ranged from about 1.25 to 2.75, with the majority in the upper 1’s. Skaters who scored 2’s were, to my eyes, pretty darn good with flow and speed. So I’m revising my goal to competing at bronze again, and getting some amount of points for every element attempted. I’d love to add +GOEs and PCS in the 2’s as additional goals, but I think that’s still a way off from where I am, so I’ll stick to that initial goal for the moment. I haven’t decided whether or not that’ll entail new programs, but I have a few months to put things together and get working! Sadly, you can never practice for the nerves. Amazing how once second you can be fine, and the next second the nerves can hit and render you almost immobile. On the upside, competing does get better the more I do it. Each time I’ve stepped onto the ice, I feel a little less sick to my stomach and terrified, which is promising. Not that I’ll ever NOT feel nerves, but it’s comforting to know it gets better. Also, competing is so much more about dealing with when things don’t go according to plan than it is about doing things perfectly as planned. In practices, I’m focused on doing things exactly as they were meant to be done, but once you’re on the ice the smallest detail can throw you! In my warm-up for the dramatic program I was marking through all the elements and their placements, and I totally mixed up the ends of the rink and got confused, which I never do. I make it a point to do my programs in both directions at my home rink so that it doesn’t throw me off when I’m elsewhere, but all it takes is a split-second and you’re lost. Quick recovery is the name of the game. After my dramatic program on Friday, I stuck around to watch the other events for most of the mid-morning (bronze and silver dramatic programs), then headed home and crashed super-early that evening. I was wiped out from the sheer effort of getting up so early, plus the nerves of competing, and then the aftermath of the adrenaline crash. On the upside, it helped me get a decent night of sleep, which I hadn’t gotten the night before. I was grateful not to have to wake up as early on Saturday, so I had a bit more time to get ready, then headed to a rink nearby the competition for a freestyle session. That rink was an utter zoo, with the regulars out in full force and the many Sectionals adult skaters on top of that. It was the kind of freestyle where it takes a lot of circling and waiting to find an opening to jump, where you’re constantly thinking someone might run into you, and where you feel like trying too hard will get you injured. So I just stayed long enough to get warmed up and feel the ice, then cut things short. I got to the Sectionals rink with plenty of time to change into my dress and stretch, jog around, and visualize my program. To be honest I was dreading my free skate a little, because there were multiple elements giving me trouble (my flip combo, my lutz, my camel spin) and more opportunities to mess up. Plus, I had already seen from the day before that the bronze level ladies were very good skaters, some quite a bit better than me. I wasn’t putting pressure on myself to win, and I think most adults will agree that it’s more about doing the best you can do, but even so, it’ll never NOT feel intimidating to know you’re competing with really good skaters. Seeing the field keeps things in perspective, both for better and for worse. This time, I was set to skate later in my group so my coach had me waiting in the locker room, and I missed seeing a lot of the programs. That was disappointing since I like to watch events, but while I didn’t actually feel like it psyched me out to watch the others, maybe there’s an unconscious effect and it’s better to stay in your own bubble? Who knows. My warm-up went pretty well. There was a rough patch when I wasn’t getting my flip combo despite repeat attempts and it was starting to get to that place where you just dig yourself in deeper into a hole by trying too hard and missing it even more. My coach saw I was overdoing it and called me over to ease off, and also said I was rushing. She reminded me to take my time and wait longer between the jumps, and that turned out to be really important advice, because I think it saved me during the actual program when I went into the flip-loop-toe loop. This combo been my big bugaboo in recent days, and the element I was most worried about, but this time I managed to pull it off and went directly into my sit spin, which is when I recall thinking, “This is going well.” I did mess up my lutz (didn’t get all the way around and two-footed the landing) but I stayed in control through my footwork sequence and pulled off a decent flip. Last was the camel-sit-backspin, and although I had to fight to keep the sit spin going, I held on and had a nice ending. There were definite bobbles and small mistakes, but even with the lutz error, I skated off feeling really great about the performance, and my coach was super happy with it too. I had no idea where I would place and I wasn’t really concerned with the scores… but when I saw the sheet I literally blurted “Oh my god” in shock to find myself in 2nd out of 7. The first place skater had unanimous 1’s all across so she was clearly better than the rest, but I had received almost unanimous scores with 2, 3, 2, 2, and 2. Because I missed most of my group I couldn’t tell how well everyone else skated, but I’d seen half of them skate the day before and hadn’t expected to place well. So I was happy to get my medal — although really, the most exhilarating thing was to do my program well and be satisfied with my performance! Okay, the medal’s not bad either. My Bronze Dramatic program was scheduled on Day 1 of the competition (Friday) in the mid-morning, which would have been great except that I was assigned to a 6:30am official practice. I know a lot of adults have to skate regularly at 6am freestyles (and my hat’s off to them), but I have a flipped work schedule where I work late afternoons through the night, and usually go to bed around 2-3am. So getting up at 4:30 was rough, especially since pre-competition adrenaline kept me up the night before. The rink was over an hour’s drive away so I had to leave early, though when I got there I was one of the only skaters who made it to my session (I think there were close to 15 or 20 scheduled, and 3 made it). The 7am practice only had 4 skaters, so I think most people decided to forgo their sessions in favor of sleep. I’d been tempted to do that too, but I was glad I took the time because the ice at the rink was pretty different from the ice surfaces I’ve skated on before, and it was definitely worthwhile to have the time to get used to it. Practice went pretty well: I warmed up all my elements for both my programs, then did run-throughs without music. My event wasn’t for 3 more hours, so my coach and I took a coffee break at Starbucks, chatted, then got back to the rink with over an hour to spare. I got dressed and did some warm-up exercises, stretched, and watched bits of the early events until 10-15 minutes before my warm-up was called, at which point I put on my skates and waited rinkside. I was initially slated to skate first after the warm-up, but there was a last-minute addition/change so I ended up being second, which suited me fine. My dramatic program has two jumps and two spins so I had plenty of time to stroke around the rink, go through each element, and get through part of the footwork before time was called. The warm-up was good and my coach was encouraging, and I was glad I only had one skater to wait through before my turn. The first skater was very, very good, and I could tell right away she would probably win, which kind of took the pressure off myself. I told myself to skate calm and smoothly (or as calmly and smoothly as I could manage, with the nerves) and headed out to do my program. My first jump (loop) was tentative, and my layback was okay-but-not-great. I should mention that my dramatic incorporates a scarf (I jump and spin with it), and at one point I missed a bit of footwork because the scarf started to slip — that was a bummer, because I had to skip one of my favorite parts in the footwork, but I didn’t want to lose the prop. The last time I skated this program I also had a freak fall on a step — one of those come-out-of-nowhere mistakes where you don’t even know what went wrong — so I was nervous when I got to that part again, but managed fine and did a pretty good salchow. Then the final element was a camel, and I knew right away I didn’t get the entry I wanted, but I held on to try to squeak in a revolution or two… and of course I fell as the spin was ending! Boooooo. I scrambled up and thankfully had enough time to hit my ending pose. I was disappointed to fall, of course, but my coach and I had to laugh it off, since we were both nervous that I’d fall in that other spot, only to fall at the end instead. One of these days I will get this program clean! My group was a combined I/II age group of 7 skaters, and I placed 6 out of 7, which seemed fair given how I felt I skated. 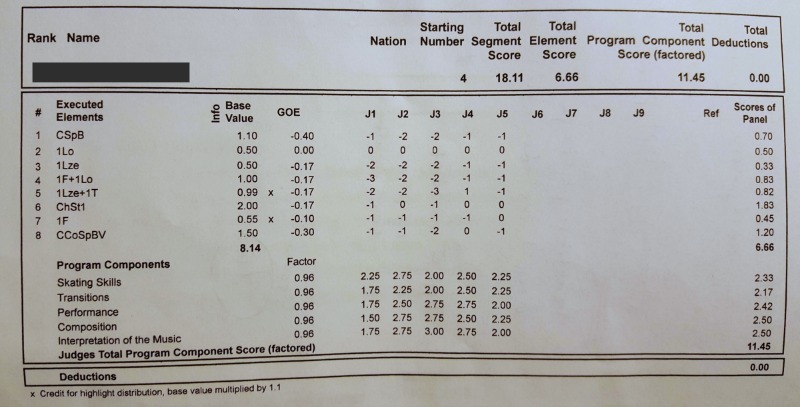 Proving that I will never understand 6.0 judging, my ordinals were all over the place, including first and last places: The five judges gave me placements of 4, 6, 7, 7, and 1. My coach was encouraged that I got one 1st place ordinal (which frankly shocked me), saying that the fall knocked me down but the higher scores show that the program has good potential. I was able to watch most of the skaters in my group and could see that the level of skill was pretty strong overall. Even skating at my best, I thought maybe 4th place would be as high as I could hope, so I wasn’t upset to be 6th with mistakes. Mostly I was relieved to have done it, and happy to have more experience under my belt. Plus, I had another event scheduled the next day, so no time to dwell on what was past. Next up: Bronze free skate!